Microaggressions are subtle, mundane exchanges that communicate hostile, derogatory, or negative messages to individuals based on group membership.1,2 They can be verbal, behavioural, or environmental,1 and include staring, glaring, comments, actions, and gestures. Microaggressions are prevalent across social environments; they exist in media coverage25, clinical therapy26, classrooms21, academia3, workplaces27, and communities19. They are powerful because of the subtle, negative messages they often send1, including that the person does not belong, and they deviate from the accepted norms. These messages are often unconscious and unintentional. In order to address the lack of diversity in STEM fields, individuals and organizations must acknowledge their unconscious biases and behaviours. Microaggressions are interpersonal and institutional28; they can be as simple as unintentionally excluding a person from an important conversation27. Education and reflection – individually, communally, and institutionally – are critical steps to making workplace and community environments inclusive to all people, regardless of the groups they identify with. Once identified, action is needed to correct policies and behaviours that have the potential to harm and discriminate against members of our communities. 1. Sue, D. W., Capodilupo, C. M., Torino, G. C., Bucceri, J. M., Holder, A. M. B., Nadal, K. L., & Esquilin,M. (2007). Racial microaggressions in everyday life: Implications for clinical practice. American Psychologist, 62, 271-286. 2. Sue, D.W. (2010). 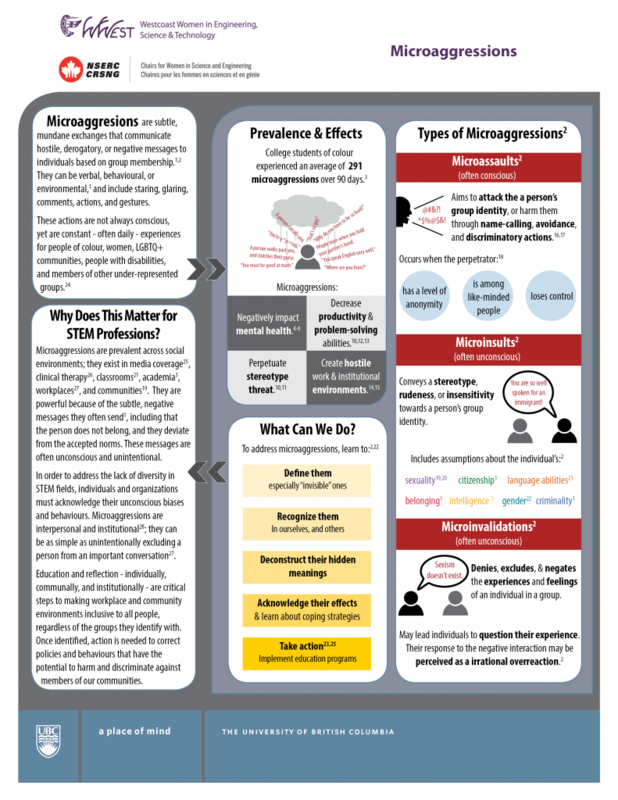 Microaggressions in everyday life: Race, gender, and sexual orientation. Hoboken, NJ: John Wiley & Sons. 3. Blume, A.W., Lovato, L.V., Thyken, B.N., & Denny, N. (2012). The relationship of microaggressoins with alcohol use and anxiety among ethnic minority college students in a historically White institution. Cultural Diversity & Ethnic Minority Psychology, 18(1), 45-54. 9. Szymanski, D. M., & Gupta, A. (2009). Examining the relationship between multiple internalized oppressions and African American lesbian, gay, bisexual, and questioning persons’ self-esteem and psychological distress. Journal of Counseling Psychology, 56(1), 110–118. 21. López Levia, C.A., & Khisty, L.L. (2014). “Juntos pero no revueltos”: Microaggressions and language in mathematics education of non-dominant Latina/os. Mathematics Education Resource Journal, 2, 421-438. 24. Nadal, K.L., Davidoff, K.C., Davis, L.S., Wong, Y., Marshall, D., & McKenzie, V. (2015). A qualitative approach to intersectional microaggressions: Understanding influences of race, ethnicity, gender, sexuality and religion. Qualitative Psychology, 2(2), 147-163. 26. Shelton, K., & Delgado-Romero, E.A. (2011). Sexual orientation microaggressions: The experience of lesbian, gay, bisexual, and queer clients in psychotherapy. Journal of Counselling Psychology, 58(2), 210-221. 27. Basford, T.E., Offermann, L.R., & Behrand, T.S. (2014). Do you see what I see? Perceptions of gender microaggressions in the workplace. Psychology of Women Quarterly, 38(3), 340-349. 28. Yosso, T.J., Smith, W.A., Ceja, M., & Solorzano, D.G. (2009). Crtical race theory, racial microaggressions, and campus racial climate for Latina/o undergraduates. Harvard Educational Review, 79(4), 659-690.